I love the traditional colors of fall. But not everything has to be shades of golden yellow, burnt orange and vibrant red this time of year. There are no rules when it comes to beauty - you can rock any color, any time. That's what makes it so much fun! 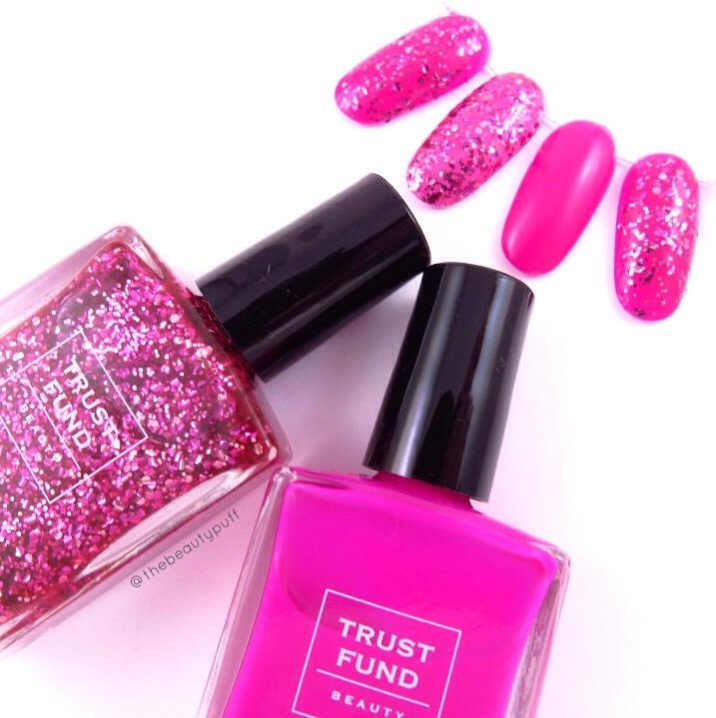 It is this spirit that resonates throughout the Trust Fund Beauty collection of nail polishes. It's no surprise, then, that these two ravishing shades made their debut in their new fall collection. My newest Trust Fund "beauties" are the stunning Bougie Behaviour and Bye Felicia. 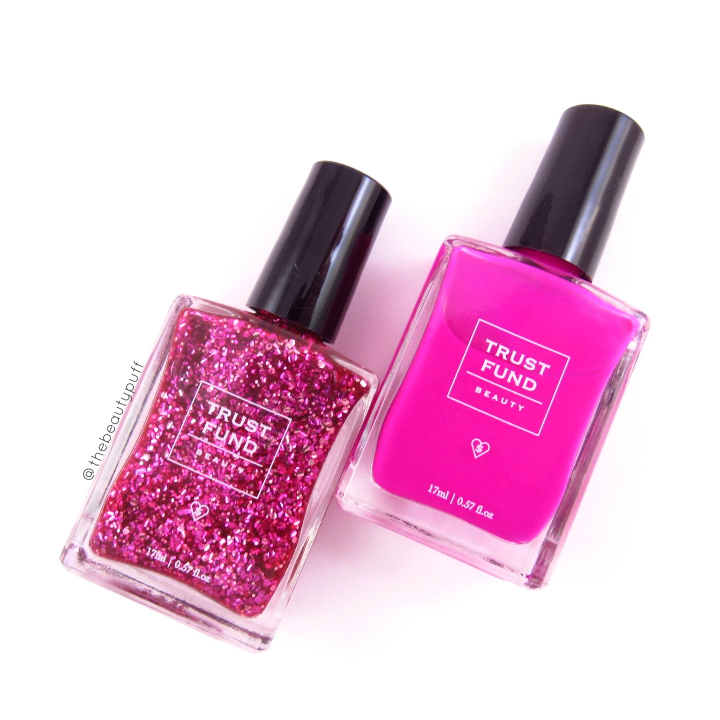 Both of these polishes are undoubtedly eye-catching and unlike anything in my collection. While scrolling through the new fall shades on their website, Bye Felicia is a definite standout. Though in the bottle it appears like a neon pink, it applies like a vibrant raspberry. It's still very much a unique fall polish, but not as electric as you would anticipate by looking at the bottle. My favorite polishes are pinks but this gives a great transition into the fall season. It still says "pink" but with a unique spin for cooler weather. Above I have swatched the polishes alone (center) and also combined (outer swatches). I think they compliment each other beautifully. There's nothing quite like a multi-faceted, vibrant glitter. Bougie Behaviour is a sheer pink base with a combination of different size glitters that really give the nails sparkle and dimension. It is a gorgeous cranberry shade with hints of lighter pink when the light hits it. I always layer glitter polishes like this to give it a plain "canvas" so to speak. I wore this glitter over Bye Felicia and it was absolutely stunning! It was a combination that was difficult to stop staring at. Think of ruby slippers, but in a gorgeous raspberry color. This may not be your typical fall combination, but it certainly looks amazing paired with neutral sweaters to give your look a pop of color.